5K run(walk) to benefit Special Olympics on 4/21…Finish on the 50 yard line!!! If you were to tell my doctors seven years ago that I was going to participate in an event in which I would be walking 5 kilometers, they would say, “you’re out of your mind.” If you were to make the same statement to my Rehabilitation Specialists five years ago, they would have had their doubts. Three years ago, they all would have simply said to me, “don’t try anything stupid to screw up your progress.” But, if you were to make the statement today that Jonathan is going to walk a 5k this Sunday morning, I bet they all would give the challenge a “thumbs up”! An FYI….I graduated from Penn State University twelve years ago and left the area. Five years ago I returned to “Happy Valley” (State College, Pennsylvania) to start a business venture. Those that know me best understand that I take the whole “We Are Penn State” deal pretty seriously. Well, one of my goals in life has always been to pass through the tunnel and onto the field of Beaver Stadium where my Nittany Lions host collegiate opponents on any given Saturday during the fall football season. Another goal has been to run (walk) in an organized event as I did from time to time before my injury. Well, this Sunday, assuming all goes well, both of these goals will be achieved. I will be participating in The Beaver Stadium 5kRun to benefit the Special Olympics. The finish line happens to be on the 50-yard line of Beaver Stadium. I’ve had my eye on this event for a couple years now, and I feel that physically this will be no problem for me. I’ve trained for a year, and I am looking forward to killing two birds with one stone on this Blue and White weekend. If some of you are wondering…1) Yes, I will have someone with me at all times to make sure nothing goes wrong during the event and 2) I will most likely come in dead last! I’ll keep you all updated on how it goes. I am very excited to pull this one off—see you on the 50!! So to set the record straight…I was dependent on a wheelchair for roughly three months after surgery. Physical therapy would eventually get me up and semi-mobile with use of a walker and then a cane, but that wheelchair was part of my daily routine for quite some time. My left leg as a whole had very little functionality. Foot drop was diagnosed almost immediately once my physical rehabilitation began. When I was discharged from in-patient therapy, we truly didn’t know if I would ever walk unassisted again. During the months that followed in out-patient therapy, a countless number of tests, devices, machines, and gadgets were experimented with in an attempt to gain functionality back to my leg. As the weeks passed, I graduated from a walker to a cane with assist from an AFO to gain stability and neutralize the foot drop. This approach was not pretty whatsoever. My gait was a complete mess and my spasticity (clonus) could set off a Richter Scale in the tri-state region! I couldn’t bend my knee, nor flex my ankle while having a very bulky leg device strapped to the affected foot. Also, I had to wear sneakers that were three times my normal size on my left foot so that the AFO could fit into a shoe. I was a sight…to say the least. But over the course of the next six weeks or so, I was starting to slowly get the art of walking back again. It was a dreadfully slow process. I remember on a couple of occasions watching small children running and playing. It was so frustrating to see this act done with extremely little thought or effort! Well…Like everything else in this road to recovery, my leg and my brain began to re-develop patterns which through countless hours of exercise and discipline started to make the connection back to somewhat of a normal stride. And walking truly gained me a glimpse of independence–which I desperately needed in those first few months. Slowly, my wheelchair took a back seat to my cane and in the weeks to come, I was taking very short and slow jaunts into the outside world once more. In my pre-stroke life, I was a rather big skiing/snowboarding enthusiast. I always knew that at some point when I was physically ready, I would get back out there. Last year with some help I tried to get back up on skis, but learned rather quickly that the left leg was not going to cooperate. The muscles simply do not fire. Balance becomes an issue immediately and general function and control is extremely limited. 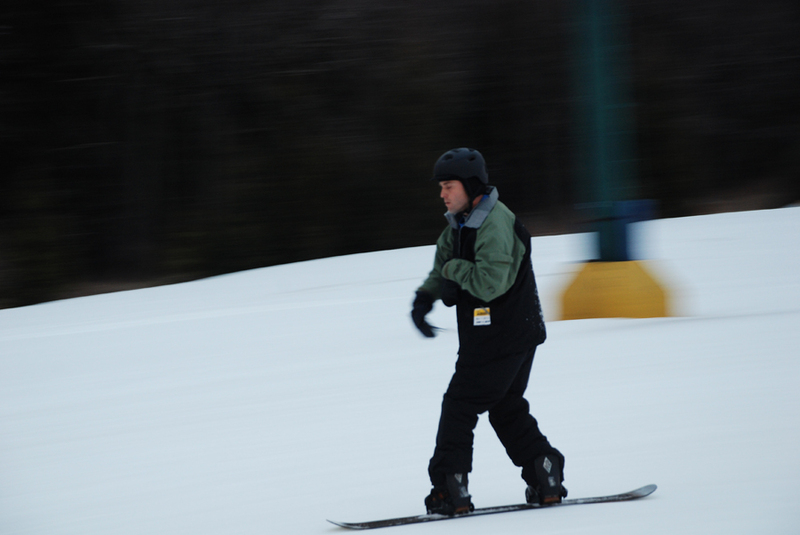 In theory, I figured that snowboarding might be a more realistic approach to get me back on the mountain. The thought here being that the bindings restrict the left leg from “doing its own thing” and balance (though difficult) is more achievable being strapped to a single unit. So during these blustery winter months I made it a priority that at some point during the season I was going to strap in for the first time in seven years. Well, through a pile of trial, error, and tweaks, we made this happen. I got up, I rode my edges, I carved by overcompensating with my right side, and successfully transitioned on and off of the chairlift. The key was that I needed quite a bit of assistance strapping in and getting up. I fell a lot; my affected side fatigued quickly, and I can tell you I was sore as hell the next day. But this was a big day in my path to recovery. I seriously doubt that I will be thrashing down black diamond slopes in my immediate future, but it’s simply the burn inside to get back out there. It’s all about the small steps that start to build the big picture. Who knows what the future holds? A corrected golf swing, strumming a guitar, walking a 5K….